For a pleasant and clean mountain, let’s take action together! Transportation: traffic jams or quiet travel on a bus? In the mountains 75% of greenhouse gases are due to transportation. Let’s reduce our travels and think about public transport or car-pooling! Energy: “it’s 23°C in our flat, let’s open the windows” No! In the mountains 20% of greenhouse gases are due to heating. Let’s insulate our houses, turn the heating down and wear a jumper. 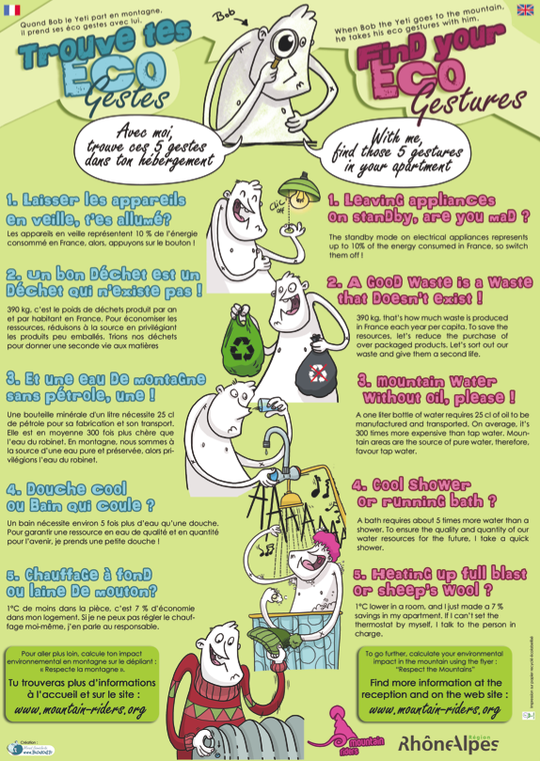 Waste: the best waste is the one we don’t produce… or the one we keep in our pockets! In 2009, 30 tons of wastes were gathered on the slopes and in the resort by around 3500 volunteers. In average, people produce 390kg of waste a year! 40% are buried, 40% incinerated and only 20% are properly recycled. Let’s reduce our consumption of plastic and sort out our waste! Environment: off-piste skiing, mind the sensitive areas! In the mountains, human beings and wildlife share the same living area. Several areas are very sensitive for the fauna and flora. It is necessary to be respectful and quiet to guarantee their survival. Let’s get informed to behave properly and try to avoid these specific areas! Water: cool shower or running bath? 30% of the French resorts don’t have a full wastewater treatment system. Let’s reduce our consumption and use eco-friendly cleaning products.